If emergency towing is necessary, we recommend having it done by an authorized Hyundai dealer or a commercial tow-truck service. Proper lifting and towing procedures are necessary to prevent damage to the vehicle. The use of wheel dollies or flatbed is recommended. 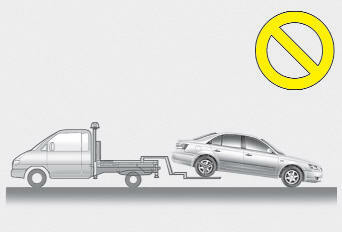 For trailer towing guidelines information, refer to section 5 “Driving your vehicle”. It is acceptable to tow the vehicle with the rear wheels on the ground (without dollies) and the front wheels off the ground. If any of the loaded wheels or suspension components are damaged or the vehicle is being towed with the front wheels on the ground, use a towing dolly under the front wheels. When being towed by a commercial tow truck and wheel dollies are not used, the front of the vehicle should always be lifted, not the rear. Before towing, check the level of the automatic transaxle fluid. If it is below the "HOT" range on the dipstick, add fluid. If you cannot add fluid, a towing dolly must be used. • Do not tow the vehicle backwards with the front wheels on the ground as this may cause damage to the vehicle. 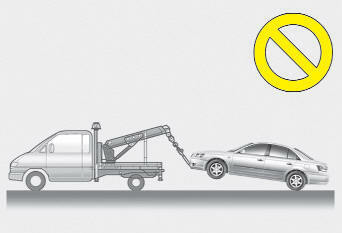 • Do not tow with sling-type equipment. Use wheel lift or flatbed equipment. 1. Set the ignition switch in the ACC position. 2. Place the transaxle shift lever in N (Neutral). 3. Release the parking brake. Failure to place the transaxle shift lever in N (Neutral) may cause internal damage to the transaxle.